One of the most popular educational features in the 3D textbook is the Living Wall. 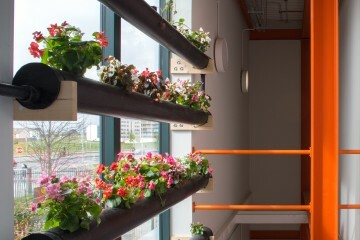 The Living Wall sits on the upper floor of the building on the west side of the building and it is a series of vertical pipes planted with comfrey. The west-facing aspect means the plants photosynthesise (create oxygen in the presence of light) predominantly in the afternoon, at which point the building has been open for several hours and there has been a build-up of carbon dioxide from the floor below. The idea is that the plants will absorb the carbon dioxide and refresh the air through photosynthesis as the day wears on. The Living Wall receives it nutrients from an unusual source – a public urinal. Every time a visitor to our centre uses the public urinal, their deposit is sent to a special tank designed by Herr Ltd of Dundalk. This tank dilutes the urine and pumps it to the Living Wall through a series of vertical pipes planted with comfrey – an organic fertiliser. At the Centre we are very aware that over 50% of all nutrient pollution emanating from households comes from toilet waste. The majority of nitrogen pollution and just under half of all phosphorus pollution is contained in residential wastewater, leading to toxic algal blooms in Ireland’s inland waters every summer. This system helps to divert some of this waste away from Irish water ways. This innovative system to separates, recovers and eventually recycles potentially harmful nutrients and essentially turns urine into fertiliser. The Comfrey leaves from the Living Wall are harvested throughout the year and composted, allowing for the recycling of nitrogen, phosphorus and potassium.